Let's be frank, there's no quintessential "burger joint" in Erie. By that, I mean something that is unique to our area, well-loved, and — for lack of a better term — burger-centric. Those are the stipulations. If there's a place popping into your head, chances are it's either A) more well-known for something else, B) not on enough people's radar, C) not particularly "local," or D) closed. 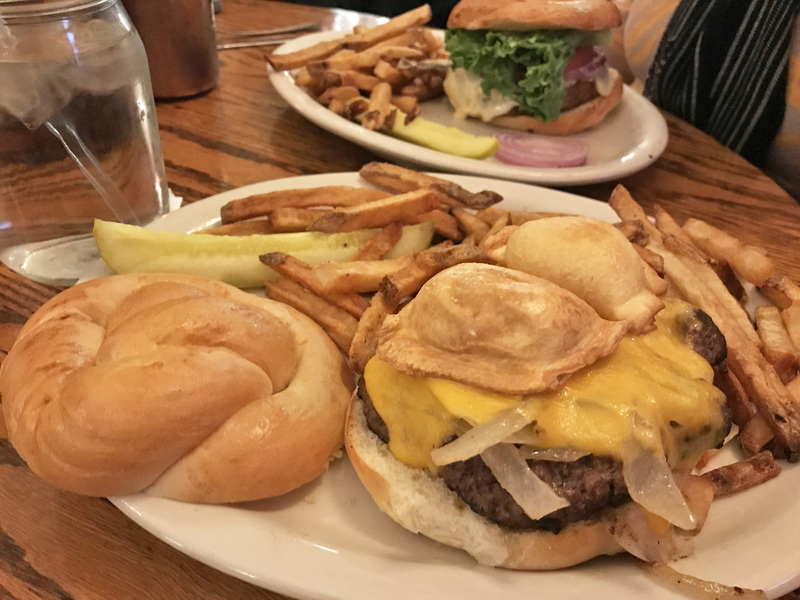 There's Erie pizza, Erie wings, Erie pepperoni balls, and all manner of unhealthy, guilty pleasure foods, but a true "burger place" has been a blank space for our fair city for some time now. That aside, there's no shortage of bun-derful delights out there to check out. While going to every place in town that's known to steam a good ham sounds wonderful, it's pretty unwieldy — not to mention being one of the least healthy challenges one could imagine partaking in. To "narrow" down the field of competitors, we culled our list from the top eight vote-getters of this year's Best of Erie Awards, eaten over the span of a month. Thank goodness I had the heart for it. Half of them come from top-notch watering holes, two of them are chain restaurants, and two of them — while topping my personal list— are more well-known for other cuisines. In alphabetical order: It's burger time. The Brewerie at Union Station — 123 W 14th St.
With eight different choices, this one seemed the most inviting; after all, one of my favorite picks at Lucky Louie's is "The Yinzer," which features a similar gimmick (for what it's worth: "The Pittsburgher" on the Brewerie menu is more of a Primanti Bros. take). With Cheddar cheese, sautéed onions, and the titular fried pierogies, this one was delicious, albeit a bit dry. The soft give of the filled pasta additions was appreciated and distinct. The fries, however almost stole the show, every one of them finely browned, the perfect partner for salt and vinegar — which just happens to be right there on every table. Points for sourcing their buns from Fuhrman's Cider Mill-Bakery-General Store as well. 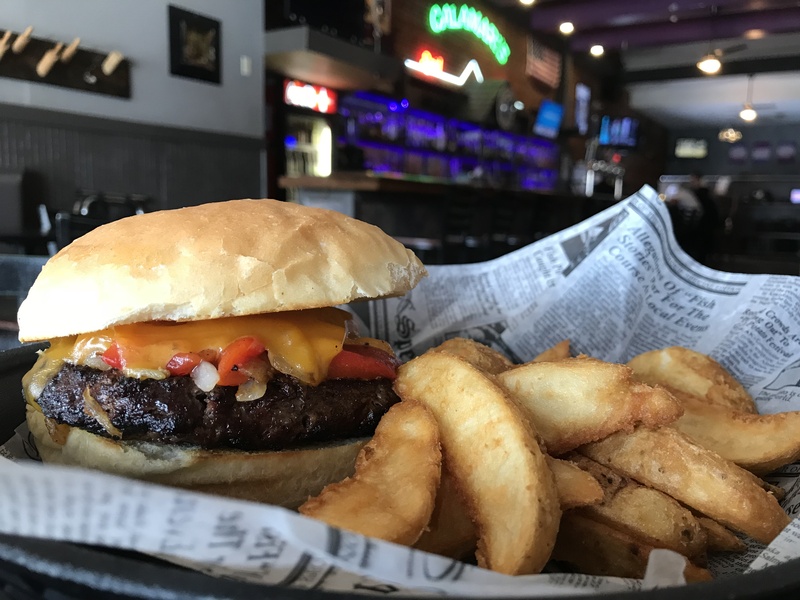 Calamari's Squid Row — 1317 State St.
At "Cali's" they encourage creativity, forgoing traditional recipes and requiring the guest to build their own burger. You get to pick three toppings out of 19 (of which eight are cheeses), with seven more choices for a small upcharge. You can also grab anything as a turkey burger (my usual choice), or a chicken breast. Choosing the beef option, of course, I went with cheddar, roasted red peppers, and well-done grilled onions. I don't think I've ever not picked roasted red peppers when they're an option. Mine came served with wedge fries but at Cali's, tater tots are always a worthwhile request and come available with Cajun or ranch (or cranch) seasonings. Theirs had a much more manageable bun size than others, making for a cleaner, better-eating experience. I'm not sure my choice was the very best possible, but the fantastic patty and billions of options, you'll love testing your personal pick. Five Guys — 1408 Peninsula Dr., 1940 Rotunda Dr. Winner of Erie's Best Burger, Five Guys Burgers and Fries is strangely hard to beat. The chain also boasts more than 1,500 locations worldwide, two of them being in Erie. It's no wonder why they're a fast-growing operation, because they make a damn fine burger. The only entry here with a sesame seed bun, the plainly named "cheeseburger" comes with two patties and two slices of Kraft American cheese. With 15 choices for free add-on toppings, I went with my usual: mayo, ketchup, pickles, green peppers, and jalapeños (one of the relatively few places to opt for the far superior fresh-cut variety, as opposed to the pickled product). At Five Guys, it's practically a sin to not get fries with that, and I opted for a light Cajun seasoning — an addicting augmentation. Keep in mind that even a "Little" fries is still an absurdly large amount and easily shareable. They pride themselves on a fresh, classic taste and pull it off perfectly. Jekyll & Hyde's — 8 E. 10 St. Okay, so I know this is not truly a beef endeavor, but this option deserves to be highlighted (full disclosure: I also tried the classic "Dr. Jekyll Burger." Fuller disclosure: it's the closest place on the list to the Reader office and happens to have a great happy hour). This specific patty is a meatless alternative available in over 3,000 locations worldwide, including all White Castle restaurants. It boasts more protein, less fat, and no cholesterol, and this is the only place in Northwest Pennsylvania that has it. I got mine with lettuce, tomato, and vegan mayo, and a side of Jeykll's thin fries with Cajun seasoning. It has an extremely convincing grain and visual similarity to beef, with an earthy taste that lacks the grease and fat. Next time I'll get it with chipotle mayo instead, which one of my table-mates wisely requested. 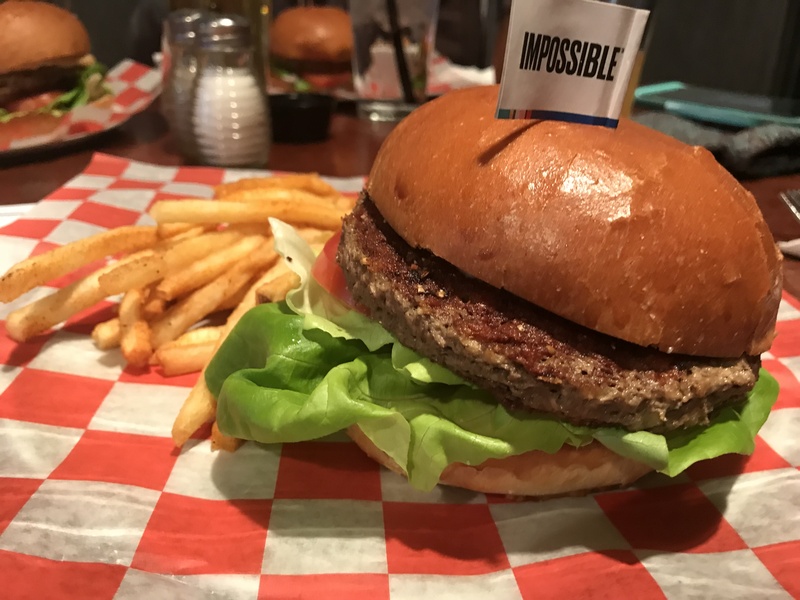 A fantastic option for vegans or vegetarians thirsting for the real burger experience, they also have a black bean burger that's worth noting, though the Impossible Burger so adeptly mimics beef that you need to taste it to believe. Max & Erma's — 2078 Interchange Rd. Max & Erma's loves this particular creation, and for good reason. 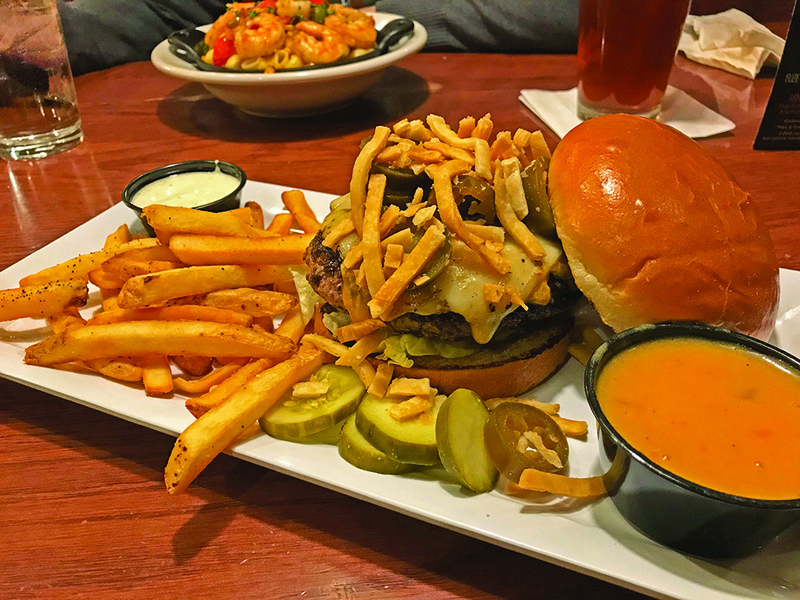 The Columbus-based regional chain has 51 restaurants in the East and the Midwest, and the Tortilla Burger is one of their flagship offerings. For something that reads as less of a Platonic ideal of a burger on paper, the taste is there. It comes with Cheddar and pepper jack cheese, jalapeños, and tortilla strips, along with lettuce, tomato, and onion. The mix of juicy and crisp items balance it out brilliantly. The addition of the tortilla soup for dipping is interesting, although it kind of takes you out of the "burger experience," and adds a chaotic element (read: messy) to the mix. You will be sold on their soup, however. 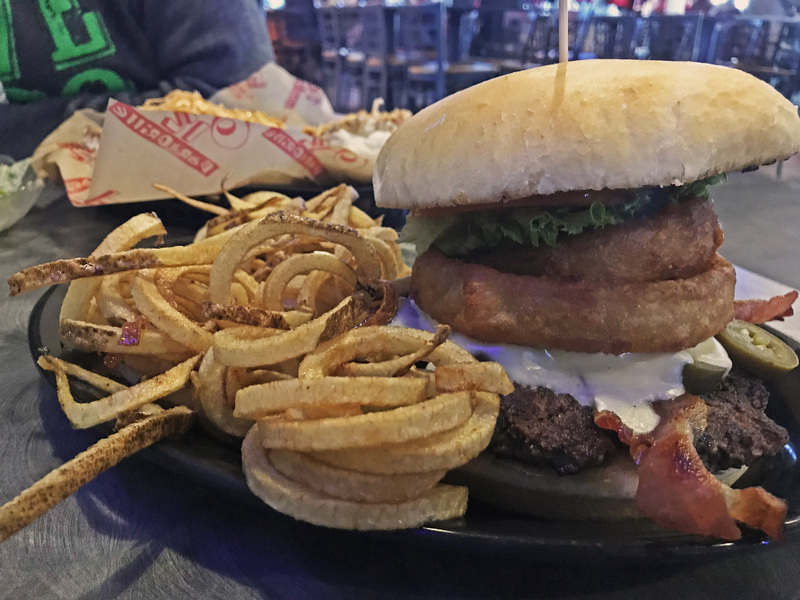 Odis 12 Sports Bar & Grille — 3702 W. 12 St.
For a place that is almost solely championed for their wings, their burgers might be the best in town. After polling our waitress for a good representation, I went with The Angry Odis (if you haven't noticed by now, I have a penchant for spicier foods). It comes with pepper jack cheese, bacon, jalapeños, tomato, lettuce, onion rings, and their "Angry Odis" wing sauce. A very wide and flat patty, it's a big one in diameter, but their choice of buns hold it all together. It's savory and spicy, with a sauce reminiscent of hot honey mustard. There's a fabulous equation of textures, and somehow nothing was overpowering. I went with the curly fries because if you can get curly fries, do it. 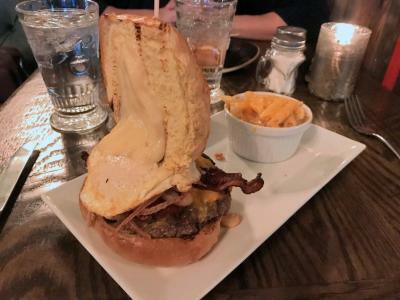 Their burger was the one to beat. Well, this one came as a shock and was one of the best burgers I've had in my entire life. Maybe it was dumb luck, but this was the definition of savory for me. It comes loaded with a fried egg, cheddar cheese, candied bacon, "cotton-fried" onion, and roasted garlic aioli. For a restaurant that offers several higher-end entrees, one might skip past the burgers, but you probably shouldn't. For my side, I chose mac and cheese, which in hindsight was far too heavy of a complement to an already achingly rich burger. You'll want to eat this one slow and watch out for the egg because it can tend to drip if unchecked. If you're in North East, or up for a small journey, be sure to check the 2018 Best of Erie awards' "Best New Restaurant" out. Voodoo Brewery Erie — 101 Boston Store Pl. This was the best ordering experience. "The Kettle" is a build-your-own option that is done via a checklist. If you've ever been to places like Pittsburgh's amazing Burgatory or the West Coast's The Counter, then you know what to expect. Though their menu has seven other choices, this one is by far the most inviting for anyone who likes things customizable. For better or worse, that puts the onus on the orderer. I ordered mine with all free ingredients: The basic bun and patty, with roasted red peppers, Cheddar cheese, and garlic aioli (unintentionally mirroring my Calamari's order which was nearly a month later). Although the thrill of deciding which ingredients to put together was a tangible one, I'm clearly not to be trusted and should have gone for some of the incredibly tempting, albeit costlier options. The burger came with Voodoo's delectable (but salt-heavy) kettle chips, but ultimately my own poor choices lead to a mediocre taste profile. I won't make that mistake when I go there again. If Voodoo wasn't a brewery (and we're letting its Meadville roots slide here), this would be "the burger joint," with points for creativity, versatility, and uniqueness. When asked, burgers were ordered "medium."